The Horror Section: More Trick Than Treat. 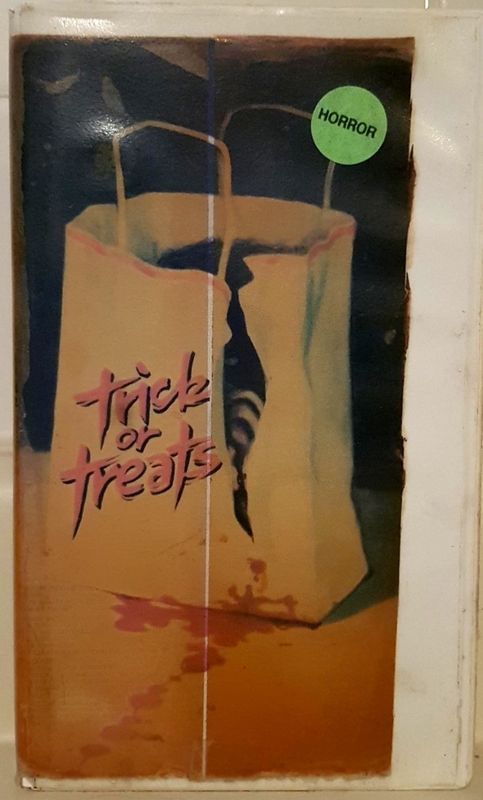 In keeping with the Halloween spirit, this week's VHS is Gary Graver's 1982 flick Trick or Treats. Linda (Jaqueline Giroux) spends Halloween night babysitting a mischievous ten-year-old (Chris Graver) unaware that his father (Peter Jason) has just escaped from an institution and is making his way back there. I've seen this movie a few times now and every time I watch it the same questions enter in my mind, how? and why? being chief among them. Trick or Treats is such an enigma to me when I try to pin down where Graver was coming from when he made this. 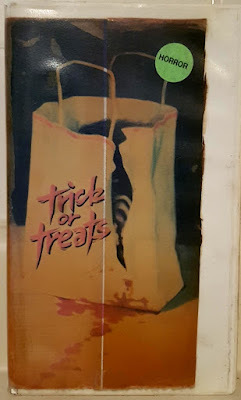 On a surface level, I assume the goal was to make a cheap Halloween ripoff, but very little of Carpenter's classic comes through in the finished product. If anything I'd say Trick or Treats has more in common with Mickey Rose's 1981 spoof Student Bodies, but since Graver never fully commits to comedy within his horror construct you end up with something completely schizophrenic. Take the opening scene for example, where “millionaire industrialist” Malcolm O' Keefe was carted off to the loony bin in a struggle that took four full minutes to play out. 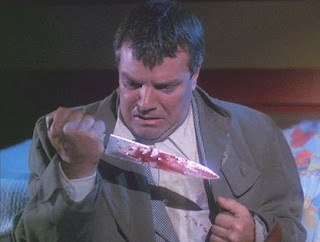 I recall the first time I watched this I was like “this movie is amazing”, until I realized that the whole movie was mainly just absurd, aimless vignettes like this one with very little actual horror to be found. On that note, perhaps the most horrifying thing about this universe is that you could just call up a number and when two dudes showed up with a straitjacket you just pointed and they'd take that person away. What followed after that was a parade of head shaking scenes with often awkward exchanges designed to fill time rather than forward the threadbare plot. While the meat of the picture was Linda continuously falling for the pranks played on her by her charge, it was kind of hard to tell while being bombarded by visiting trick or treaters, calls from her boyfriend and the B story-line of the husband escaping the asylum in ridiculous fashion and making his way across town. At one point it seemed like Trick or Treats had completely jumped movies by showing two women editing a bad (worse) horror movie to the point they lamented how editors were not appreciated in the industry. This was an odd declaration considering how poorly paced this movie actually was. 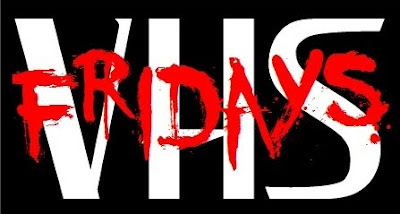 But wait, there finally was a connection as one of them showed up at the babysitter's place only to be dispatched for no other reason that to remind us that we're watching a horror movie. Peter Jason as Malcolm O'Keefe. Another bizarre thing about this movie was how many character actors Graver was able to get onscreen. While perhaps David Carradine, Paul Bartel and Carrie Snodgrass owed him favours, Steve Railsback and Catherine “Log Lady” Coulson showing up at metered intervals must have just been good luck. Again, I have to wonder why Graver felt so compelled to make this movie. Imdb states he sunk some of his own money into it and employed other cost cutting measures such as using Snodgrass's home to shoot and even cast his own son as the brat. Despite its many flaws, Trick or Treats has significance to me because the dynamic between Linda & Christopher was one of the main inspirations behind my second short film, Lively. As meandering as the plot was, I still can't help but laugh at all the improv, miscues and random ADR. I have no idea what Graver originally intended, but the result is a glorious mess.